6volt 77AH hard rubber battery for the Model A Ford. Fits the original Battery Tray. NOTE: THESE ARE SENT OUT WITHOUT ANY ACID. YOU WILL HAVE TO HAVE THE BATTERY FILLED AT A LOCAL BATTERY SPECIALIST. ACID FILLED, SO COLLECTION ONLY. 6volt 85AH heavy duty version of the hard rubber battery for the Model A Ford. If you want the ultimate in battery technology for your Model A, this is it. They are excellent at delivering very high starting currents in the most extreme of conditions. They suffer less damage from deep discharge, long term storage, and vibration than any conventional battery. (Don't forget, you will need to order the Battery Hold Down Frame A-51660-XPC). Modern 12v battery, 70AH. 570A. Ideal, if you have converted to 12 volts. These fit the standard Model A ford battery tray, but you will need to use the A-5163-B corner clamp set. Battery support Hold down frame for the 1928-31 Model A Ford. Ford originally used this die stamped style battery hold down from August of 28 until May of 29, but it will work on all years. Very good quality! Powder coated black! Made in USA. Battery Support Frame when using the modern Optima 6v Battery. (Plain steel). New black powder coated version of the battery support frame. This is required when using the modern Optima 6v Battery. Battery cover plate 4-1/8" wide. The cover that snaps into the opening over the battery in the floorboards. Made of heavy gauge steel with spring steel locating strips that are riveted in place as original. Powder coated black! Made in USA. Battery cover plate 5-1/4" wide. The cover that snaps into the opening over the battery in the floorboards. Made of heavy gauge steel with spring steel locating strips that are riveted in place as original. Powder coated black! Battery support 1928-31. A well made original style battery support. Powder coated black. Made in USA. Battery support Bottom plate. For the original battery carrier assembly. If just your bottom plate is rusted out, why not just replace it instead of replacing the whole carrier. Plain steel, requires finishing. Made in USA. These are the special studs and nuts that hold the battery support in the frame, and they also hold the battery frame or clamps in place. These are the cast battery hold down clamps as used on the 1928 Model A Ford. These cast style clamps were used with the square battery hold down frame that didn't have the mounting holes in the corners. Used from beginning of production until August of 1928. Set of 2. Made in USA. Exact duplicate of the battery hold down clamps Ford used from 1930-32. These hold the battery by the corner only. Can be used for any year. Set of 2. Every Model A should have one of these! Why burn up your model A when you can save it with this nifty little device. Provides 30 Amp protection. Installs on the engine side of starter switch with existing screws. To install assembly, remove the generator wire from the starter switch, and attach it to the stud on the fuse assembly. Then attach the pigtail wire from the fuse to the starter switch. Authorized by the Model A Judging Standards. 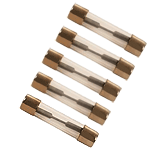 Set of five 35A fuses for the A-11450-SF Safety fuse kit. Always best carry extra fuses for your safety fuse unit. Safety Fuse Mount Set for the 1928-34 Fords. When adding a safety fuse, you may need two longer screws to mount it. These are the two screws with the lock washers. using one of the starter motor fixing bolts. 100 amp battery Isolator switch complete with rubber cable insulators. This is a more economical switch than our heavy duty version, which you install between the cable going from the battery to the starter switch. This style of disconnect attaches directly to the terminal on the battery, and cable attaches to the opposite end of the switch. Attaches to the negative post. Simply lift up the battery access cover, and unscrew disconnect to save draining the battery or possibly a fire due to a shorted wire. This switch gets fitted between the cable going from the battery to the starter switch. If you ever would run into an electrical problem, this will cut off all the power. Installation is very simple if you use our A-14300-DMB and A-14300-J cable. This handy bracket uses the lower starter mount bolt for mounting. Provides a perfect mounting for the A-14300-D disconnect switch between the frame and the starter. Powder coated black. Made in USA. Extra engine earth or battery disconnect switch cable. Designed to be used as an extra earth strap or with the A-14300-D disconnect switch when mounted at the starter using the A-14300-DMB bracket. Essential when using electronic ignition, to give a perfect earth for the engine. Battery Cable 1928-31. 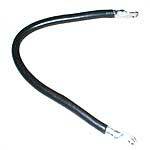 This is the 19" cable that runs from the battery to the starter switch. Correct braided fabric covered cable. Made in USA. Ground Strap 1928-31. The braided steel ground strap. Made in USA. Copper Ground Strap 1928-31. This is the flat coper ground strap that Henry used on all model A Fords. Battery Ground Bolt 1928-31. Bolt,nut and l/w to bolt the battery ground strap to the cross member. Made in USA. 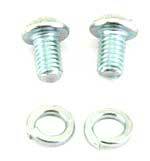 Ground Strap Bolt for the 1928-30 Model A Ford. This special headed bolt was used to attach the ground strap to the cross member of the frame from 1928-March of 1930. Made in USA. Battery Cable Support 1928-31. This supports bolts onto the transmission case. Holds the battery cable so it will not rub against the pedals and short out. Made in USA. 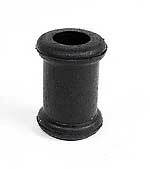 Terminal Box Grommet 1928-31. Grommet for where the switch cable passes through the terminal box. Made in USA. Also, Battery Cable Support 1928-32 Extra Grommet For Cable Support. This supports bolts onto the transmission case. Holds the battery cable so it will not rub against the pedals and short out. Made in USA.